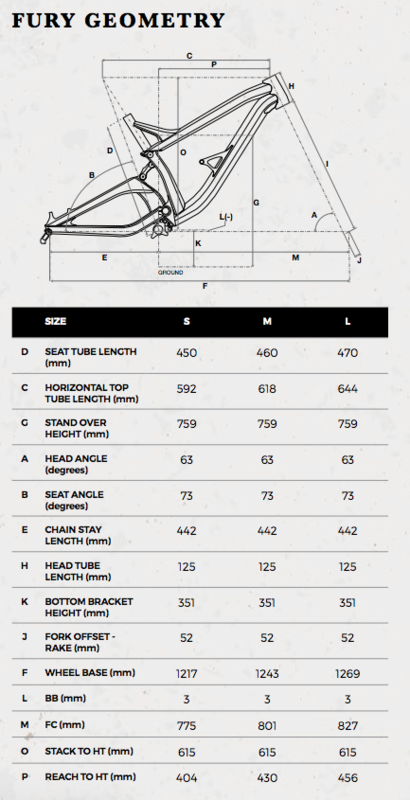 GT 2018 - Fury Geometry Need help with sizing? Get in touch! From multiple world championships to rampage victories... Yeah, it's that friggin' good! With 210mm of rear travel and a downhill-specific Independent Drivetrain system, be prepared to stick to the ground when you want to and take flight when necessary. The new Fury has been designed in conjunction with the best in the business from the beginning. The result is a lightweight, stiff, and efficient pedalling frame that can take what you can dish out.